This fun summer soap looks just like a snow cone! 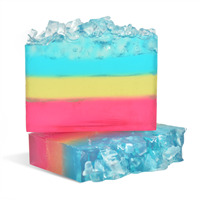 Kids would enjoy making this soap as much as they would enjoy using it. To plastic beaker, mix 0.50 oz. of fragrance oil and 0.25 oz. of Vanilla Color Stabilizer. Set aside. To microwave-safe measuring cup, add 13.5 oz. of cut up Clear Soap base. Heat in microwave in 30 second intervals until soap has melted. Remove and stir. To beaker, mix Neon Pink Mica powder with 6 ml of fragrance mixture. Add to melted soap and stir well. Pour soap into the loaf mold and let it harden. While the soap is setting up, measure 7 oz. of soap. This is for the top of the loaf. Cut or mince the soap into small squares so it looks like pieces of ice. To microwave-safe measuring cup add 13.5 oz. of cut up soap. Heat in microwave until soap has melted. To beaker, mix Neon Yellow Mica powder with 6 ml of fragrance mixture. 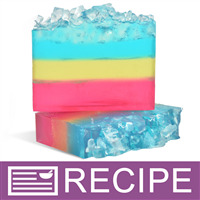 Add to melted soap and stir well. .
Spritz the top of the pink layer generously with rubbing alcohol to help the layers stick together. When yellow soap has cooled to 130°F, pour soap over the pink. Let soap set up. To microwave-safe measuring cup, add 12.5 oz. of cut up soap.Heat in microwave until melted. To beaker, mix 6 ml fragrance mixture with Neon Blue Powder. Add to soap and stir well. 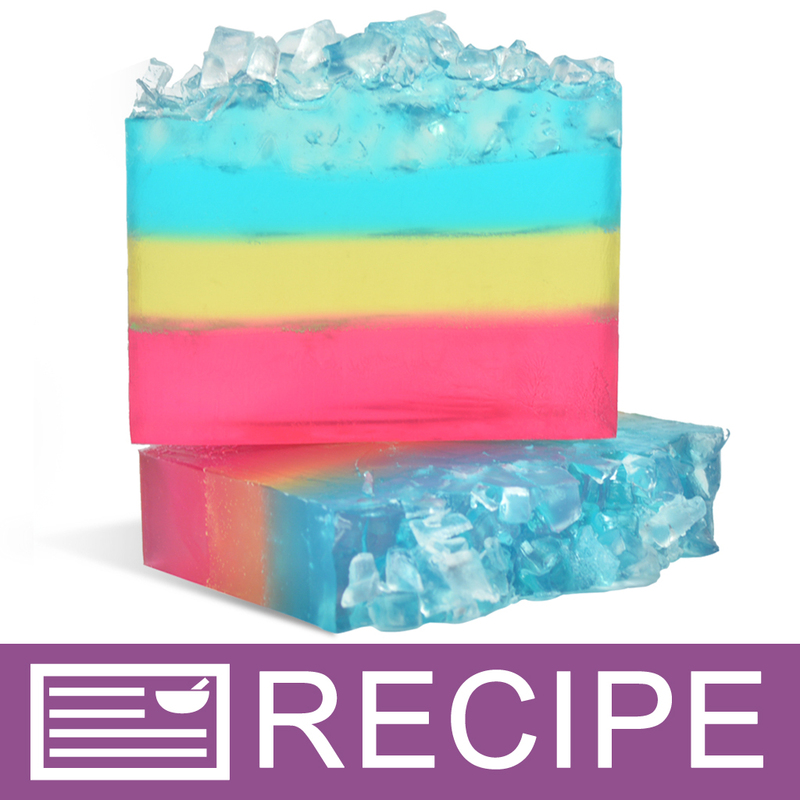 Spritz the yellow soap generously with rubbing alcohol and pour the blue soap into the mold. Let the blue layer harden for about 15 minutes so it has a thick skin on the top. In plastic beaker, melt 1oz. of clear soap and heat until melted. Spritz all of your clear chunks (ice cubes) with alcohol and add to the top of soap. Drizzle the blue soap all over the top to help set the "ice" in place. Add more melted soap, if necessary. Let soap completely set up. Slice soap and package as desired. We recommend wrapping tightly with clear plastic wrap. "Am I missing something or do your ounces not add up accurately for the total amount needed?" Staff Answer We went over our recipe and found an error when we listed the amount of soap base. The amount of Extra Clear MP Soap Base is 47.5 oz. not 40.5 oz. We have made corrections to the recipe. Thank you for bringing this to our attention. "New to soapmaking here. How long does each layer need to set up before adding the subsequent layers?" Staff Answer For a loaf this size each layer may take between 30-60 minutes depending on the environment and how hot the soap is when poured.